A variety of free school graduation certificate templates from Grade 1 to Grade 12 to reward students for completing a school year. Just print the award certificate templates and fill in the details (student’s name, teacher’s name and date). You can either type in the details or print a graduation certificate template and fill in the details by hand. The following certificate of graduation can be personalized with your photo and text. 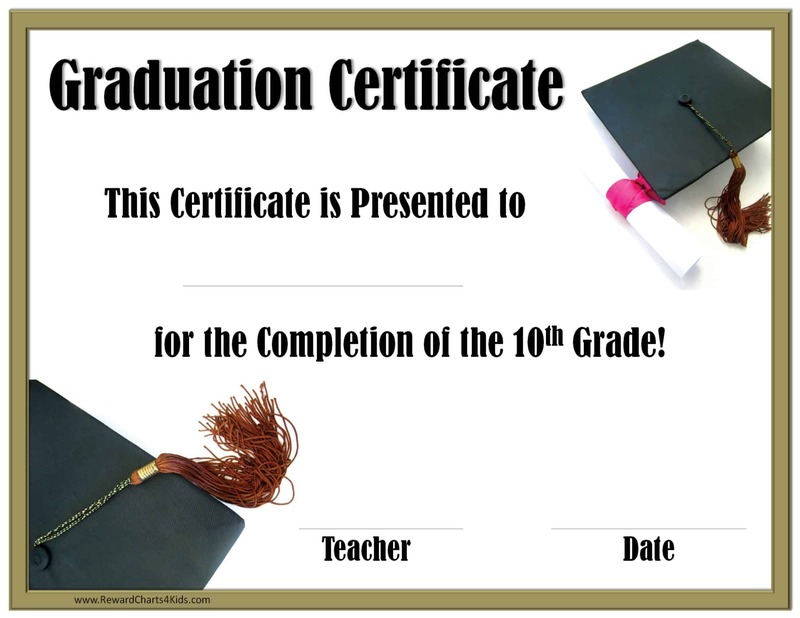 Create a unique award for each student. Just wondering why these do not continue up through the 12th grade? Thanks! Jessica, thanks for your comment. The certificates have been updated and now continue up through the 12th grade. The 6th grade template says 1st Grade. Thank you! Elizabeth, thanks for letting me know. It has been fixed. Your 6th grade customize certificate still says 1st grade. Thanks! Rebecca, I have double checked this and it says 6th grade. I wonder if you opened it before it was changed and your browser is showing the older version. If so, then you will need to clear your cache or refresh the page. Some browsers keep showing older versions to reduce loading time. You can also trying opening with another browser or refreshing the page (F5). I am also trying to print some certificates. The “add names afterward” ones are all correct, but the “type details before you print” say 1st Grade for 5th on up. Thank you so much for these certificates! We can’t replicate the problem. We have opened each link and they all show the correct grade. Can you please send a link which shows a certificate with an incorrect grade.